Click on the map to find out more about the areas de Cúellar's visited on his travels. A survivor, Captain Francisco de Cúellar recorded events of 413 years ago, in graphic detail. 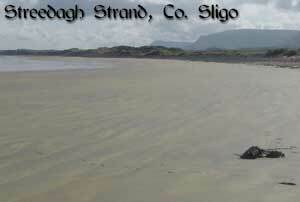 He documents his shipwreck, on Streedagh the subsequent horrors ashore, and his attempts to find hospitality from friendly chieftains (O’Rourke and McClancy) in the then English garrisoned North Sligo Leitrim, as he tried to make his way back to Spain via Antrim and Scotland. His account paints a fascinating picture of life and living conditions in this part of Ireland at the time. 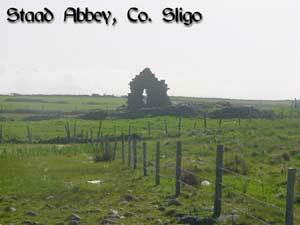 On returning from the beach, if the visitor walks to the top of the lane directly opposite the Spanish Armada Memorial, as you look across the intervening farmland, it is possible to discern close to the shoreline, the single surviving gable wall of Staad Abbey. To where, on gaining the shore de Cúellar walked in search of help, unfortunately the English had been there before him. At Glencar lake, de Cúellar comes upon a group of unoccupied huts, that it would appear were used for storage of oats. On entering one of these huts he finds that three other Spaniards seeking refuge already occupy it. These are his first contacts with compatriots, since leaving the beach. Here at Castletown, the O’Rourkes of Breffni maintained one of their many strongholds in the district. A “dissident” chieftain, Brian O’Rourke offered shelter and succour to the escaping Spaniards for which amongst other “crimes” against the Crown, he suffered the ultimate punishment, he was executed at Tyburn in London, on 3rd November 1591. De Cúellar was part of a party of twenty Spaniards that went in search of a ship, word of which they had received while staying with O’Rourke. Separated from his compatriots because of injuries sustained in the wrecking, lost and disoriented , he stumbles along in what he hopes is the general direction he should be going. Here in the lonely Glenade Valley, while following the directions given him by the Clergyman, Francisco now falls in with another traveler, who tricks him into going to his forge in the valley where it is his intent to hold de Cúellar captive and force him to work for him. 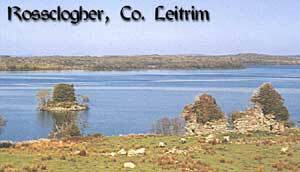 Here at Rossclogher just outside Kinlough on the southern shore of Lough Melvin de Cúellar came under the protection of McClancy with whom he stayed for three months. Maglana, as de Cúellar referred to McClancy, paid like O’Rourke with his life, shot and then beheaded, at Lough Melvin, in 1589.